Ricardo Averbach is the winner of the 2010 American Prize in Conducting at the College Division, and received the 1st Honor Diploma at the 2010 Masterplayers International Music Competition in Lugano, Switzerland. He is Director of Orchestra Studies at Miami University and Past-President of the College Orchestra Directors Association. As an opera conductor he received the 1st prize at the National Opera Competition hosted by the National Opera Association as participant in the production of Poulenc’s Dialogues des Carmélites (1993, University of Michigan) and 2nd prize as Music Director for the production of Cendrillon by Massenet (2011, Miami University). Previously he served as Music Director of the Echternach Festival Orchestra in Luxembourg, the University of Pennsylvania Symphony Orchestra and Wind Ensemble, the University of Michigan Campus Orchestra and the Orquestra Sinfônica Municipal de São Paulo in Brazil. 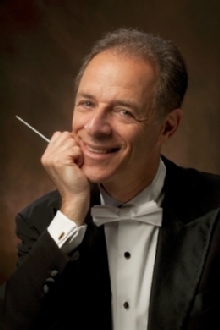 Averbach conducts regularly in South and North America and Europe, having performed as guest conductor in Russia, Bulgaria, Portugal, Italy, Luxembourg, France, China, Brazil, Azerbaijan, Armenia, Ecuador, Dominican Republic, Mexico, India and the United States His discography includes several world premiere recordings, which have sold more than half a million copies.